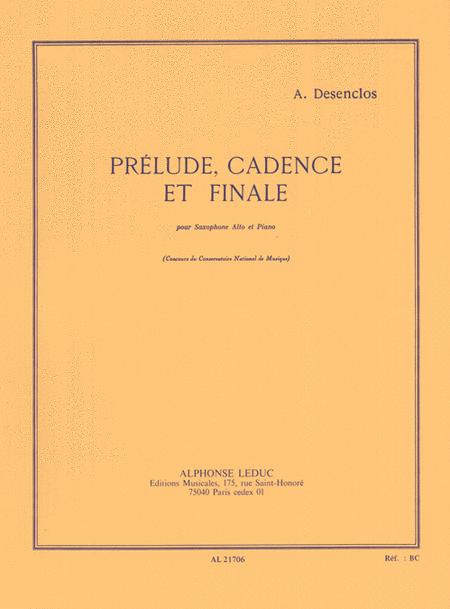 Prélude, Cadence et Finale is a piece for alto saxophone and piano written by Alfred Desenclos in 1956, as a Paris Conservatoire Contest piece. 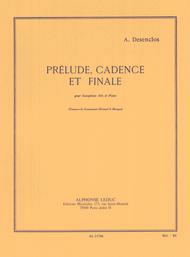 Dedicated to Marcel Mule, the famous French saxophonist, Prélude, Cadence et Finale is divided into three parts and presents many compositional techniques characteristic of the Impressionist period. Prélude, the first section, introduces recurring rhythmic parts and develops themes that will reappear throughout the piece. The second section, Cadence, corresponds to a dynamic saxophone cadenza. The Finale is quite dramatic and uses some of the elements that previously appeared in the piece. Alfred Desenclos (1912-1961) is a French composer who won the Prix de Rome in 1942. He also composed masses such as Messe de Requiem and other pieces for double bass, harp, flute, trumpet or French horn.